Next up on our Song-By-Song preview is the official entry from Denmark, “Higher Ground” by Rasmussen, written by Niclas Arn and Karl Euren. The song is performed in English. Rasmussen is an accomplished singer and actor, and is best known for his popular 80s cover band Hair Metal Heroes. 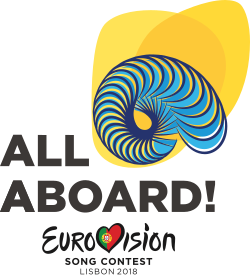 The song will be performed 5th in the competition order on the second semi-final on May 10. You know, the random draw I did to determine the order of songs for our Song By Song preview is absolutely KILLING ME today! Three of the best damn songs in the contest, and all on the final day! Damn, I LOVE THIS SONG! The song is based on an ancient Viking legend about Magnuss Eriendsson, who along with his warriors chose to put down their weapons and fight for peace instead with words. Inspiring and utterly awesome, especially in the times we’re living. The staging of this number is amazing, and I’d love to see what could be done with an actual music video – the song lends itself in look and feel across the boards from “Game Of Thrones” to “The Lord Of The Rings“. WOW! I”m gonna go with my gut here – hey American record labels – GET THIS GUY A CONTRACT AND PUSH THE HELL OUT OF THIS SONG!! You’ve got a potential monster on your hands here! Denmark has been around in EuroVision since year two in 1957, and have three Grand Final championships under it’s belt – 1963’s “Dancevise” by Grethe and Jorgen Ingmann; 2000’s “Fly On The Wings Of Love” by Olsen Brothers; and 2013’s “Only Teardrops” by Emmelie de Forest. They have participated 46 times throughout the years, and their 37 year span between winners is one of the longest gaps in the contest’s history.